Xi’an is famous all over the world not only for its unique ancient cultural history but also for its fantastic Chinese souvenir shopping. Some excellent offerings specific to Xi’an include: Chinese calligraphy rubbings, Tang pottery replicas, Terracotta Warrior replicas, Folk paintings and Folk paper cuttings . Paper-cut is an ancient folk art in China. This traditional art form with special patterns can be dated back to 2000 years and is loved by people at home and abroad. It is one of the most popular traditional arts in China. It comes from shan xi province villages,on spectical days like festivals and weddingd ,villagers like to decorate doors and windows of their homes with colorful paper cuttings. The themes involved in Chinese folk paper-cut art are diverse and colorful. They vary from subjects in daily life with which people are familiar to the future life about which people dream. These subjects teach us the simple and pure feelings of working people. 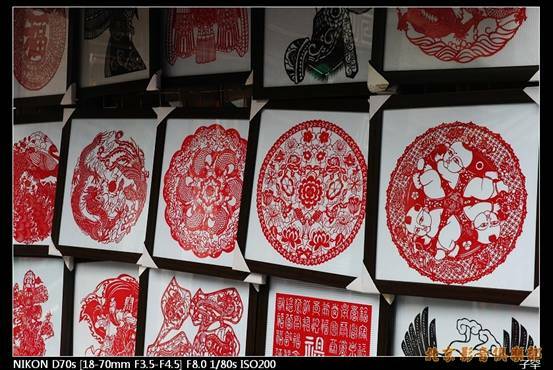 Paper-cut works are available on sale in art shops in Xian. Tri-Colored Glazed Pottery of the Tang Dynasty or Tangsancai was the essence of Tang dynasty art. In the ancient Tang Dynasty over 1,000 years ago, people glazed tomb figures, pottery with three main colors, red, green and yellow. So later, people called these multi-color glazed items Tang San Cai. The yellow, green and red glazed ceramics are fired at high temperatures to give the finished porcelain an amazing colorful pattern. Products slimmer in shape were fired during the Jin Dynasty, and a fuller ones were popular during the Tang Dynasty. The most popular subjects are the horse, camel and human figures. The ancient chang’an was the capital of the tang dynasy.excavated from the tang tombs are a great many pieces of tri-colour ceramic figures,houses and camels.these pottery figures carry a great signigicance in the study of the history ,social life and culture and art of the tang dynasty. The tri-color ceramics consists minly of the three colors of yellow,green,and red. Resorting to high skills and purely ancient methods the tri-color potteries they turned out look very vivid and ture to life.the pottery lady figures are noble in shape and elegant inposture,and the maids are gentle and the warriors are tall and handsome.each of them has own individual personality.the pottery horses and camels are robust and vividly shapes with special artistic glamour and feature,henceneing regardes as things precious to be treasures by visitors from both at home and abroad. 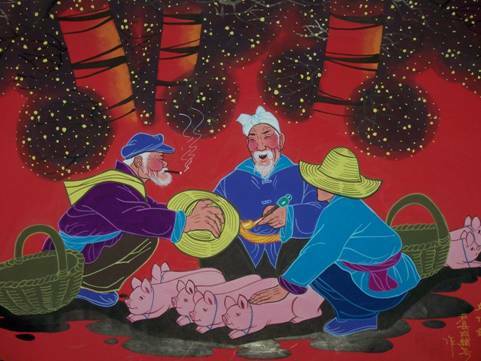 Huxian County in Shannxi province is well-known for its peasant paintings. With several thousand amateur artists this county boasts a long history of traditional arts and crafts such as paintings, embroidery and knitting. Among the peasants ranging from 10 to 60 years old,many can draw well .The Huxian peasant paintings originated in 1958.Since then,peasants in Huxian have created hundreds of thousands of artistic paintings.They paint with a distinctive style ,by means of blackboard, newspapers, murals,gouaches, paper-cuts, wood-cuts and slides. The artistic style originated from the local people’s life. In the past ,the paintings appeared on the walls of kang(heated beds),on the plane of kitchen range and on wooden chests and wardrobes. Persons, plants, animals and birds are common subject matters of these paints.Inspired by some bold and unconstrained imagination, the peasant painters draw a clear and plain sketch and then paint with colors of strong contrst.Such unique artistic works are always well received by tourists and experts alike. Where you can buy these souvenirs? There are many historical relic shops in Xian, such as Shu Yuanmen (an art street), which is laid out in the style of an ancient street; Xian Antique Market; and Wenbaozhai Tour Shopping Center. Tang tri-colored glazed pottery and replicas of clay figures of warriors and horses, as well as folk handicrafts of paper-cut and cloth art, can be found there. Under the ancient city wall behind the Forest of Steles in Xian, there is a well-known street in the style of ancient towns - Shu Yuan Men. Both sides of the slab stone road are lined with buildings in the Ming and Qing styles. Various crafts and arts are sold on this crowded street all year long. Historical relics, calligraphy, paintings, antiques, jewels, and folk art fine works are all tourist favorites. Xian Antique Market is located at the intersection of Zhuque Lu and Nan Erhuan Lu (Southern 2nd Ring Road) near the Small Wild Goose Pagoda. From large furniture to small coins, the market contains every possible antique known to collectors - but you should be on guard against replicas. 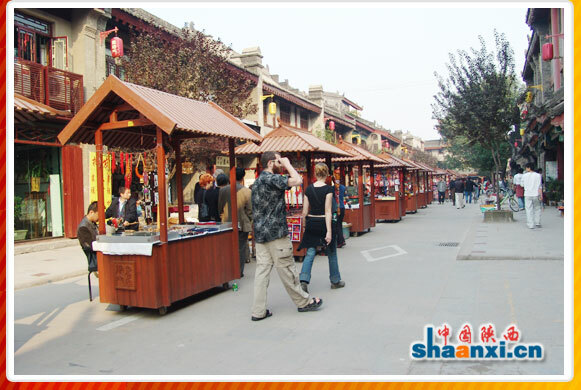 Wenbaozhai Tour Shopping Center of Xian is one of the earliest fixed tour shops for foreign travelers in the Northwest. It is an important window opening Xian to the outside world, gaining the unanimous praise of Chinese and foreign guests. Dealers sell silk rugs, woolen blankets, silk clothing, jewels, jade articles, calligraphy, paintings, historical relics, antiques, model clay figures of warriors and horses, and bronze cars and horses - altogether 35 categories and more than 200 kinds of goods. The address is No.5 Yanta Lu Zhongduan.